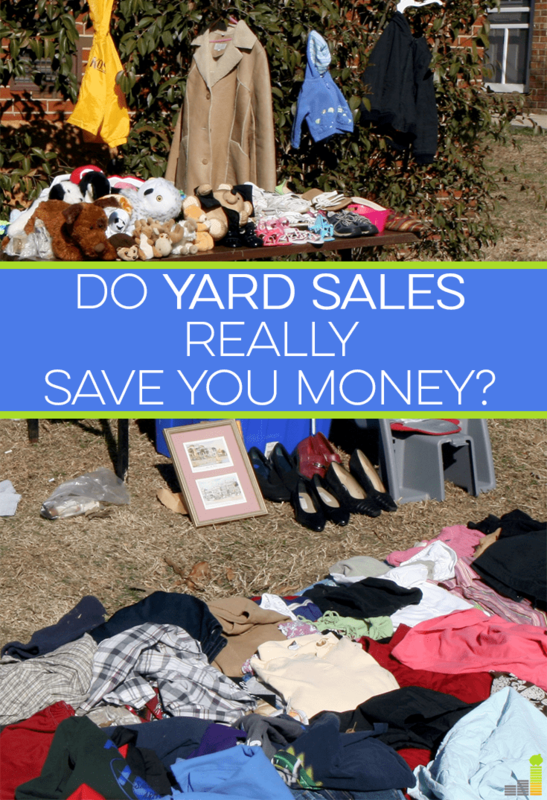 Do Yard Sales Really Save You Money? As I’ve worked to whittle down my need for more things in order to become more frugal and minimalist, I’ve had to take into consideration my consumption habits wherever I go, even when I’m shopping frugally. One thing that’s always been deemed acceptable with a frugal lifestyle is shopping at yard sales (and estate sales, thrift shops, and flea markets.) Lately I’ve been trying to figure out how to balance a desire to have a minimalist lifestyle with my love of junking and shopping at yard and estate sales. 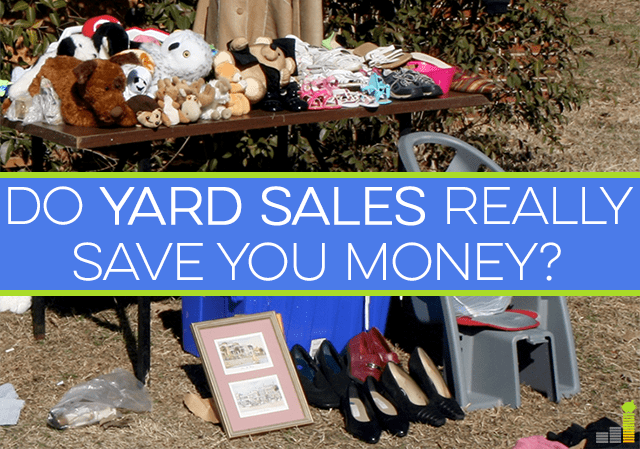 How Can Yard Sales Not Save You Money? Since going to yard sales is about shopping for used goods at rock bottom prices, how can it go against frugality? Is that even possible? I love going to estate sales. My heart starts pounding when I pull up to one, and I feel like I need to get out of the car while it’s still rolling in order to beat everyone else to the goods. I’ve never been to the opening of an estate sale that didn’t have a line outside the door of people waiting to get in. Once you get in, it’s all elbows and squeezing through hallways so you can get to everything before everyone else. I’ve often had more stuff than I could even carry in my two arms, stuff that I didn’t even know I needed until I saw it at the sale. For me, estate sales started to become entertainment and “just for fun” shopping, which isn’t much better than “just for fun” mall shopping, especially when you already own everything you need (which I do.) If I only go to estate sales just for fun rather than out of need for a certain item, it’s not only going against frugality, but minimalism as well. I found that many times when I was out shopping at yard sales, I was never going for anything in particular other than the thrill of the hunt. And once I realized what I was doing, I decided I didn’t like it. At that point I realized that I wasn’t necessarily saving money and that estate sales were becoming a type of money saving tricks that ultimately didn’t work. I’m not spending tons of money when I’m going, but all I’m really doing is continually buying junk that I don’t actually need. I don’t need to spend any more money, and I really don’t need anymore stuff cluttering up my home, especially someone else’s junk. I thought I was alone in this until my sister confessed that she too hates yard sales for that very reason. One Man’s Junk Is Another Man’s Treasure… Or Is It Still Just Junk? There are plenty of times that shopping yard sales makes perfect frugal sense, such as furnishing your first apartment or shopping for baby items when you are pregnant. (It’s what I did.) But how often do you go to a yard sale looking for something in particular? If you do go for something specific, the odds of finding that one particular item are probably slim. People have yard sales to get rid of junk and clutter. We then peruse the junk and decide which pieces of it we want to take home with us to clutter up our own homes, at least until we have a yard sale of our own. It’s a junk cycle. So does it really save us money? Or are we just buying more stuff that we don’t need, albeit at a fraction of the cost? While buying used is always better for the environment and your wallet, it’s still important to be mindful of what you actually need so that you don’t promote over-consumption in your life, even if it’s only when you’re buying secondhand goods at yard sales. But honestly, if yard sale and thrift store shopping is what it takes to keep you out of the mall and the credit cards in your pocket, then keep on thrifting, my friends. Do you love yard sales or hate them? If you love them, how often do you go and how much do you buy? Do you have one type of shopping you love to do? I’ve only recently gotten into the thrift store experience. When I go, what I’m looking for is unique one-of-a-kind decor items. Anything from the 50’s and 60’s is my thing. It’s allowed me to buy items of a quality that would never be affordable for me otherwise, and it’s a carefully curated collection of items that go together and are useful to me. I think the key to good yard sale shopping is being willing to walk away. You aren’t saving any money if you are buying stuff you don’t need anyway. Some yard sales will be busts, while others will be goldmines. That’s just how it is! I agree, Holly. But instead of walking away, I prefer to just not go anymore. I like to forgo the temptation altogether. I simply haven’t had time to go to yard sales recently. My wife really likes going to them, but I dislike the fact that when you go you typically can tell within a minute or so if there is anything useful. But you may be right about junk being junk. I’m sure if you frequent garage sales you will end up with a lot more stuff than you need. I enjoy going to yard sales but I go to find deals on items so that I can resell them online. It’s rare that I find something at a yard sale the I actually need. I love yard sales! I only buy the items that I need or know that I will actually use. I usually only go when I am looking for something very specifically though, like furniture, tools, or equipment. I’m pretty much out of things I need for my house now, which is why I don’t go. I’m working on getting rid of all of the excess I have. I don’t shop yard sales, garage sales, flea markets, or estate sales – I just have them. I have a garage/yard sale every year and I usually end up $250-350 richer and with less junk in my house. Win-win! I’m jealous. I’m too far out in the country to have a successful yard sale. Our neighbors had one a couple of years ago just to try it out and made a grand total of 12 bucks. Not worth it! I know what you mean about location. My house is too far from the beaten path for a successful yard sale. My solution to the problem is a community yard sale. The county animal shelter hosts an annual sale at the county fairground. An outdoor space is $18 and indoor space is $26. Last year’s sale drew 1,200 shoppers. This year I plan to be one of the vendors. It’s three months away and I’ve already started cleaning and pricing things to sell. I have a few friends who are avid yard salers, and they will call me if they spot a deal on something they think I should have. We bought a baby camping backpack for $8, and I’ve gotten a pile of clothes for my son for $10. I have also committed to only buying picture frames at yard sales. I do have a bad habit of buying books at yard sales, which I almost always regret, even when I enjoy the book. At least you aren’t paying a lot of money for the books when you do buy them, so when you’re done reading them, you could donate them to the library. I restore furniture for a side job/fun, and I am banned from garage/yard sales. I just cannot resist a good deal or someone else’s “treasure.” And I do get competitive when I know it is a short time sale or deal. So now, I send my husband out to look for me. He knows what I am looking for and how to spot a good deal. If it’s worth it, then I am allowed to check it out and try to haggle. I’m not crazy about yard sales here in LA, as I feel most people just donate their stuff to avoid the hassle. I feel like yard sales were better in Kentucky… I do love thrifting though. I love pawing through racks of clothes and dusty shelves of trinkets to find a diamond in the rough. I do agree that I usually find things I didn’t know I needed until I saw it, but I’ve found some items I truly love. I think the key is to be mindful as to whether the items will actually be useful or whether they’re just a good deal or unique. We buy our dog stuffed animals at the thrift store. We recently bought five for $1.75. If we had bought them retail we probably would have spent about $30. We have a little dog and he just loves his monthly ‘new’ toy. We keep the rest on the top shelf of the closet.